66" (167.5 cm) wide and 29" (73.5 cm) long. 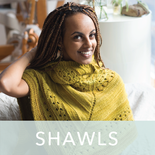 This blanket-like wrap is worked from the bottom up, starting with a very simple four-row lace pattern. 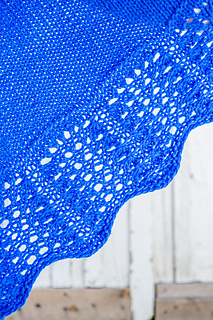 Decreases are then worked at the edges and center to make a shallow but generous triangle. 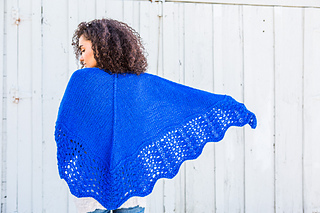 Blocking spreads out the lace edge for a large wingspan that will keep you cozy all winter. 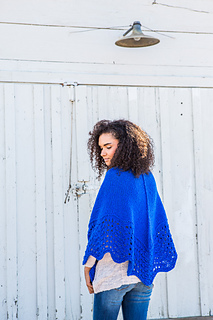 Work it up in a lofty, bulky wool such as Imperial Yarn Native Twist for a plush but lightweight shawl. 66” (167.5 cm) wide and 29” (73.5 cm) long. 544 yd (497 m) chunky weight (#5 Super Bulky). 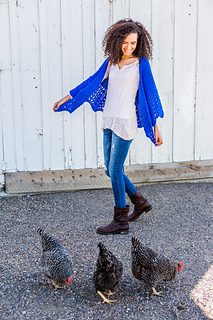 Shown here: Imperial Yarn Native Twist (100% wool; 150 yd/4 oz hank): color #06 Cobalt Blue, 4 hanks. Size U.S. 13 (9 mm) 40” (100 cm) or longer circular (cir). Markers (m); removable marker; tapestry needle. 10 sts and 15 rows = 4” (10 cm) over St st.